The AMA released its lane splitting position statement back in November 2013, and we spoke at length with AMA Board of Directors member Jim Viverito and AMA spokesperson Pete terHorst about this long-awaited move in December. Beginning with the April 2014 issue, the AMA began running articles on lane splitting in American Motorcyclist magazine, written by retired CHP Sergeant David Kinaan, who was supervisor of the California Highway Patrol Academy Motorcycle Training Unit. The AMA has provided us here at LaneSplittingIsLegal HQ with PDFs of the articles for our lane splitting resources page. American Motorcyclist is read by lots of riders outside California, so the first article, ‘Lane Splitting Safely,’ provides background on lane splitting in California, the CHP lane splitting guidelines, and the AMA position statement. It’s good stuff, providing excellent tips for riders who don’t live and breathe the culture of lane splitting like we do here in California. Keep your eyes up and use your peripheral vision. Look well ahead of you constantly to recognize changing traffic conditions. Keep your headlight on. Check your motorcycle to make sure it is operating properly. Don’t lane split at speeds faster than 10 mph over the speed of the prevailing traffic, and never exceed the speed limit to lane split. When the flow of traffic starts slowing and stopping ahead of you, don’t be in too much of a hurry to begin lane splitting. Only split when there are two or more traffic lanes in one direction. The article closes with notes on what the CHP and OTS are doing to educate drivers and riders in California. Another component of safely lane splitting in California is educating automobile drivers that the practice, when done properly, is completely legal. The California Highway Patrol has, along with the California Office of Traffic Safety and the California Motorcycle Safety Program, produced pamphlets and posted safety announcements on their websites to spread the word. Motorcycle enthusiasts need to do our part by riding safely at reasonable speeds, and leaving a reasonable space between us and the other vehicles on the road. Respecting the space of other vehicles on the road will go a long way toward ensuring your safety and promoting a safe partnership between motorcyclists and other road users. Here’s the article. It’s a big PDF, so if the embed isn’t working you can download it here. Splitting lanes is a skill that will take a rider time to develop and will take the rider’s undivided attention. Once mastered, and practiced safely, splitting traffic can make for a safe and even flow of traffic for all who travel the roadways in California. Here’s the May article. It’s a big PDF, so if the embed isn’t working you can download it here. Even though SB350 is dead, it’s of the utmost importance that we continue to be good ambassadors—splitting responsibly and safely, in line with the CHP guidelines—and continue to educate both riders and drivers, if we want to keep lane splitting legal. 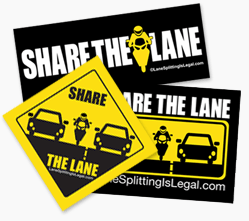 The AMA lane splitting position statement and these recent articles reflect this viewpoint, and reinforce our recommendation here at LaneSplittingIsLegal.com that riders should join the AMA to help us have a voice on these matters.